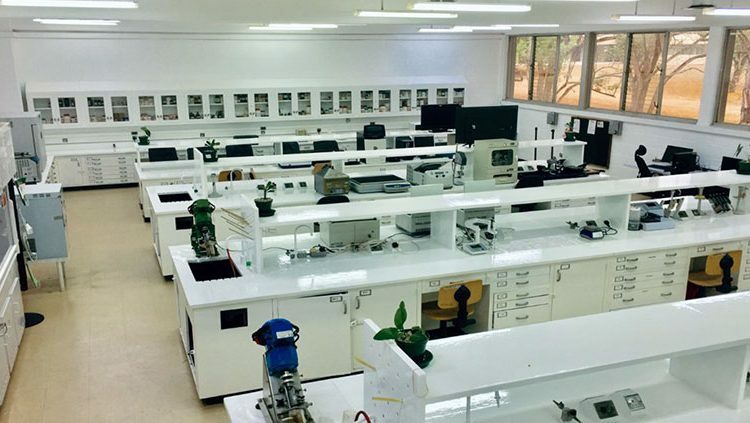 The Virology and Germplasm Health Units (GHU) kicked off 2019 with renovated research labs. IITA Director General, Nteranya Sanginga, accompanied by members of the management team, Kenton Dashiell and Hilde Koper, inaugurated the upgraded facilities on 14 February. Lava Kuma (with camera) addressing Management and staff during the tour of the newly commissioned labs. 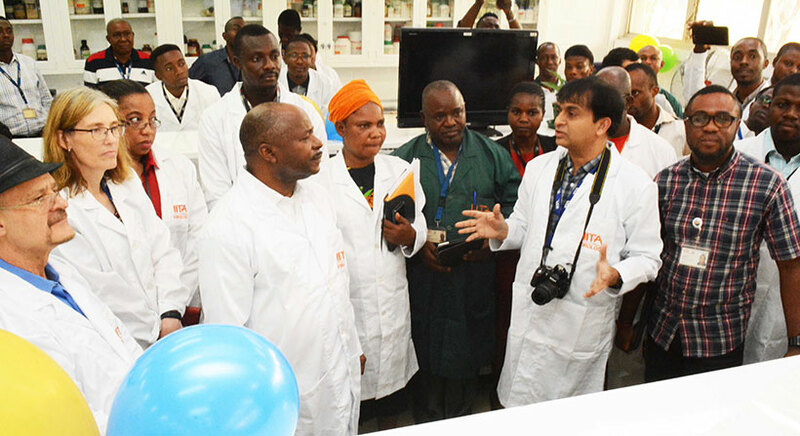 Dr Sanginga congratulated the team and said the new facilities add to the world-class research environment IITA is creating to foster scientific innovations necessary for agricultural transformation in Africa. It epitomizes IITA’s zeal for renovation and innovation and is a tribute to the team who work smartly to make this vision possible. 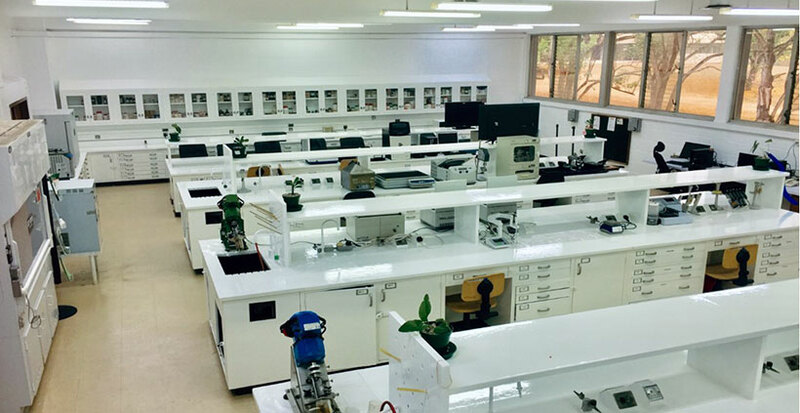 “The renovation expands our capabilities to use new technologies and improve the learning environment for staff and students working on a range of topics in virology, diagnostics, phytosanitation, seed health testing, epidemiology, phenotyping, and others,” said Lava Kumar, Virologist and head of GHU. “The updated facilities have a better aesthetic look and I hope that. the improvements will pave the way to augment labs with modern equipment to support cutting-edge research,” he added. One of the renovated labs. The Virology Unit evolved from the Plant Health Management Division of IITA, the birthplace of classic and applied plant virology in West and Central Africa. The Unit is involved in the world-class interdisciplinary research on some of the most complex plant virus disease problems plaguing crop production in sub-Saharan Africa. Research and Development (R&D) efforts have resulted in great success and continue to provide knowledge, technologies, and procedures necessary to solve emerging and reemerging virus disease challenges. The Unit also plays an important role in developing plant virology capacity in the subregion. GHU is the “gateway for safe international exchange of germplasm.” GHU ensures IITA‘s compliance with national and international phytosanitary procedures and assists in preventing transboundary spread of seedborne pathogens and pests. GHU and Virology work complementarily in ensuring the health of planting materials generated by breeding and seed increase programs for international distribution. “Renovated labs improve motivation and continue to attract bright, young talent to our discipline,” said Patricia Ogunsanya, Research Associate and the longest serving member of staff in Virology. The new facilities are a shot in the arm for transdisciplinary research through a combination of digital technologies, biotech, and conventional plant sciences. The event was attended by the colleagues from Facilities Management Services (FMS) and Farm Management Office that contributed to the facelift, management staff, and IITA scientists. IITA News goes mobile: App launched today!